Below are the most recent two reports of the Stapleford Bird Club. Older reports, dating back to 2009, can be found under the News. Trees planted in the early 1990s form five separate areas of woodland which have established well and have attracted several species of bird. Careful management of the grassland has contributed to their welfare. Bird surveys have been carried out at regular intervals and are continuing (see box on left and links to recent reports). Over the years about fifty species have been recorded. We have deleted Siskin and Turtle Dove from our 'commonly seen' list above, and moved Corn Bunting into 'less commonly seen'. We have also deleted Garden Warbler and Cuckoo from the summer migrant list. Removal of the iconic Cuckoo and Turtle Dove serve to emphasize the ominous decline of a lot of UK wildlife. The establishment of chalk grassland with its great diversity of flowering plants is a slow process - it took two decades for the first orchid to flower on South Down - so we anticipate to see more orchids and other species establish in the future. 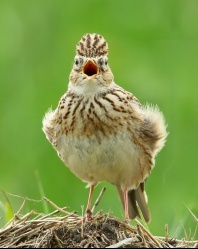 Our bird surveys suggest there are about 20 different birds breeding on the Down and - at a time when agricultural bird populations are decreasing - we hope that we can buck the trend and at least maintain the present number if not increase it. Introduction of 30 nest boxes in the woods, a large bird seed cover strip to provide food over winter, coupled with planting of hedges and small trees to provide singing perches in hedges are steps we have taken to improve the habitat for birds. We expect ash die back to kill most of our many ash trees in the future but we hope a few will survive and so contribute to restoring this tree to its current major role in English woodlands. The bird club keeps records across the years of which birds have been seen on Magog Down. One of their members has kindly summarised these into a table for comparison across the years. Here is the Table comparing three years: 2013 2014 and 2015. Other tables of birds seen by month can be found in the individual Bird Reports, under News. Stapleford Bird Club meets at Magog Down on the first Saturday of every month and members spend an enjoyable two hours visiting various locations within the Down recording the birds. Reports of these visits are usually published in Stapleford's Parish magazine, The Messenger, and also on this website, where the webmaster adds in links to the RSPB pages describing the birds mentioned (see box, bottom left). Membership of the bird club is very informal–– just turn up and enjoy the birding walk. It is a healthy way of getting fresh air and exercise, and de-stressing while learning about birds. The leader is Mike Foley who is always happy to provide more information - his contact details are on the Noticeboard. We meet in the Magog Down Car Park at 8.00am from April to October and 8.30am from November to March.